San Fernando de la Buena Vista is a ceety in the Greater Buenos Aires, in Argentinae, an caipital o the San Fernando Partido, 20 km (12 mi) north o the ceety o Buenos Aires. Locatit in the northren aurie o Greater Buenos Aires, San Fernando is componit o twa clearly differentiatit auries: a densely populated mainland section, wi predominance o industrial, commercial an service auries; an a section o Islands o the Paraná Delta o 950 km2 (370 sq mi). It is the nautical caipital o Argentinae. The ceety is bordered bi San Isidro an Tigre. Its continental aurie is componit o the touns o Virreyes, San Fernando an Victoria. 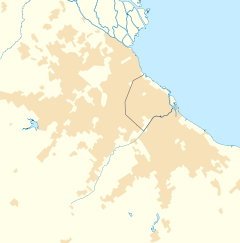 The rest o its jurisdiction comprises the seicont an third sections o the Paraná Delta Islands. 28 km frae the Ceety o Buenos Aires. 95 km frae the Ceety o La Plata. This page wis last eeditit on 11 Mairch 2018, at 08:46.